DEERFIELD BEACH, Fla. (February 11, 2014) – Like many boxing promoters in North America, Hall of Famer “Iron” Mike Tyson’s stable of Iron Mike Productions (IMP) fighters are predominately Latino (see classic photo gallery below). Many of his top Latino fighters will be in action February 22 as IMP launches its new monthly boxing series, “KO Kings of Tomorrow,” at Sands Casino Resort in Bethlehem, Pennsylvania. The IMP boxing series will be broadcast worldwide as low-cost pay-per-view events over Universal Streaming Network, live from Sands Bethlehem Event Center, for only $4.99 via http://www.ustream.tv/universalstreamingnetwork. IMP’s Latino contingent of fighters are led by International Boxing Federation (IMP) junior lightweight champion Argenis “The Thunderstorm” Mendez and two-division world titlist Joan “Little Tyson” Guzman. The Feb. 22nd “KO Kings of Tomorrow” card is stacked with IMP Latino contenders and prospects such as world-rated featherweight Claudio “The Matrix” Marrero (14-1, 11 KOs), who faces Mexican invader Jose Angel “Pepe” Beranza (36-28-2, 28 KOs) in the eight-round main event, plus two-time Dominican Republic Olympian Juan Carlos Payano (14-0, 8 KOs) versus Mexican bantamweight German “Panteonero” Meraz (46-28-1, 25 KOs) in the eight-round co-feature. Marrero is rated No. 9 by the World Boxing Association (WBO), while Payano is ranked No. 2 by the WBA (the No. 1 spot is unrated), No. 10 by the World Boxing Council (WBC) and No. 15 by the International Boxing Federation (IBF). Cuban light heavyweight Humberto “El Don” Savigne (11-8, 8 KOs), rated No. 4 by the WBC, takes on Baltimore boxer “The General” Maxwell Taylor (18-6-1, 8 KOs) in an eight-round bout. 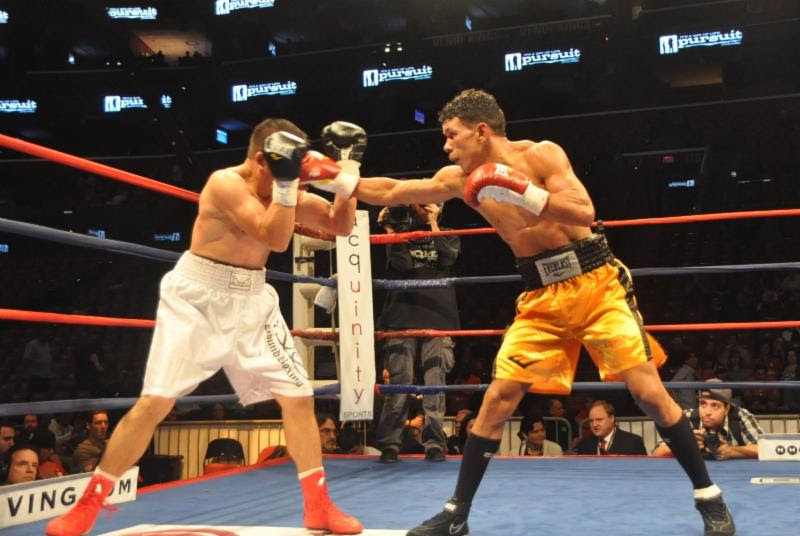 Cuban super featherweight Alexei “The Mexican-Cuban” Collado (17-0, 16 KOs), who is rated No. 15 by the WBA, plans to extend his perfect win streak against Mexican veteran Edgar “Basuras” Riovalle (36-16-2, 25 KOs) in an eight-round match. Puerto Rican-American featherweight prospect Dennis Galarza (2-0, 1 KO) meets Jesus Gonzalez (1-1) in a four-round bout. Rising star Erickson “The Hammer” Lubin (3-0, 3 KOs) tangles with Tirobio Ball (4-1-1, 1 KO) in a four-round Special Welterweight Attraction. 2012 National PAL champion Lubin, fighting out of Orlando (FL), was considered Team USA’s No. 1 overall prospect for the 2016 Olympics prior to him signing a promotional contract with Iron Mike Productions last October 1 on his 18th birthday. Lubin fought on ESPN Friday Night Fights this past weekend for the second time in a row. The gifted southpaw registered his third consecutive first-round stoppage as his much more experienced opponent, Roberto Acevedo (13-13-1), was unable to answer the bell for the second round. Also on the undercard in a six-round fight are a pair of unbeaten welterweights, popular Moossen (PA) resident “The Who Can Mexican” Samuel Vasquez (12-0, 8 KOs), the two-time All-Army and Armed Forces Champion, and Dominican Republic fighter Berlin “The Rock” Abreau (7-0., 5 KOs). Azerbaijan middleweight Farid Aghaev will make his pro debut in a four-round fight vs. an opponent to be determined. Marrero, Payano, Lubin, Savigne, Collado and Galarza are promoted by IMP. All fights and fighters are subject to change. Other top IMP Latino fighters not in action Feb. 22 include Dominican Republic cruiserweight Lenin Castillo and 2008 Olympic gold medalist Felix Diaz, 2008 Cuban Olympic silver medalist Yudel Jhonson, and Mexican super bantamweight Moises “Chucky” Flores. Tickets priced at $200.00, $125.00, $75.00 and $50.00 are on sale and available to purchase at the Sands Event Center Bethlehem Box Office, visithttp://sandseventcenter.com/event/details/ko-kings-of-tomorrow-featuring-mike-tyson/, all TicketMaster outlets, www.ticketmaster.com, or call 1-800-745-3000. To inaugurate the “KO Kings of Tomorrow” series one lucky ticket holder will be selected to sit ringside with “Iron” Mike. Doors open at 6:15 p.m. ET with the first bout scheduled to start at 7:15 p.m. ET. Tyson will perform his acclaimed one-man show, “Undisputed Truth,” onFeb. 20 at Sands Bethlehem Event Center. Maxwell Taylor (18-6-1, 8 KOs) in an eight-round bout.